Does the fur fly in your cat family? In this companion to her successful introduction to cat behavior Think Like a Cat, Pam Johnson-Bennett, the award-winning author and feline behaviorist, shows how adding another cat to your home does not have to be the start of a kitty apocalypse. Although cats are often misunderstood as natural loners, Johnson-Bennett shows how to plan, set up, and maintain a home environment that will help multiple cats - and their owners - live in peace. Cat vs. Cat will help readers understand the importance of territory, the specialized communication cats use to establish relationships and hierarchies, and how to interpret the so-called "bad behavior" that leads so many owners to needless frustration. Offering a wealth of information on how to diffuse tension, prevent squabbles and ambushes, blend two families, or help the elder kitty in your family, Cat vs. Cat is a welcome resource for both seasoned and prospective guardians of cat families large and small. 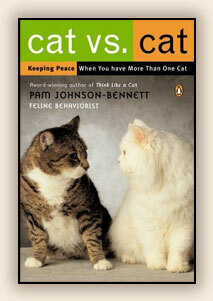 "Cat vs. Cat will be a huge relief to the head of any multicat family...a comprehensive guide in clear, friendly prose." As a Feline Behaviorist, Pam Johnson-Bennett has appeared on numerous television and radio shows, written articles for the top cat publications, and has been profiled nationally in magazines and newspapers. She works on a referral basis by veterinarians. Her housecalls cover everything from routine training problems to the most eccentric feline behavior. In Nashville, she can be heard on WKDA-AM, hosting her weekly radio show, "The Pet Hour." Her first book, Cat Love, was inducted into the Cat Fancy Hall of Fame. Her second book, Twisted Whiskers, was honored with the Cat Fancy Editor's Choice Award and received the Cat Writers' Association Certificate of Excellence. Her third book is the best-selling Psycho Kitty?. She has also authored Hiss and Tell: True Stories from the files of a Cat Shrink. Pam lives in Nashville with her husband, four cats, and a dog.